“The trouble with working on a Wednesday“, one military gentleman once remarked, “is that it cuts into two weekends“. I don’t like it either, as usually it’s the day of the week when I catch up with some of the little routine things that need doing regularly, none very important but a nuisance if I don’t do them. When you are a freelance and your work is largely driven by when other people decide to do things that you want to photograph you lose the kind of structure that most employment provides, and I find it good to have one fairly fixed point in the week. Not that I don’t work on Wednesdays. I’m sitting here on a Wednesday writing this and later – after I’ve been out on a few errands in my local town centre – I’ll be putting in several hours of work on getting my web site closer to date, and perhaps also another few on getting images ready for my next book. But I’ll be ignoring the several possible events in my diary for today, interesting and possibly financially rewarding they might be, largely because it’s a Wednesday. If they had been on yesterday I would have gone. It has to be something that I’m really interested in to get me out on a Wednesday, and on July 8th there were several such events taming place, some because it was Budget Day. Of course I wasn’t going to get out of bed to take the usual ritual picture of the Chancellor that the papers would almost certainly run (though a large squad of press photographers lined up for the non-event the chances of any particular image being used are fairly low) but quite a few people would be taking the day as an opportunity to protest at the various cuts in welfare spending that were bound to be announced. Prominent among the protesters were of course DPAC, Disabled People Against Cuts, and I’d received a message from one of the organisers that as well as the widely advertised ‘Balls to the Budget’ protest at Downing St, they were (as usual) planning a little surprise later. 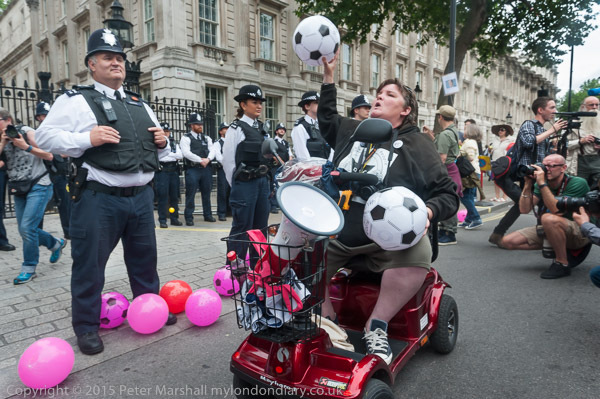 What makes the picture of Paula Peters of DPAC attempting to throw a football with a message into Downing St for me is the policeman standing watching, thumbs tucked behind his waistcoat, standing in a row of pink and orange balloons and balls. 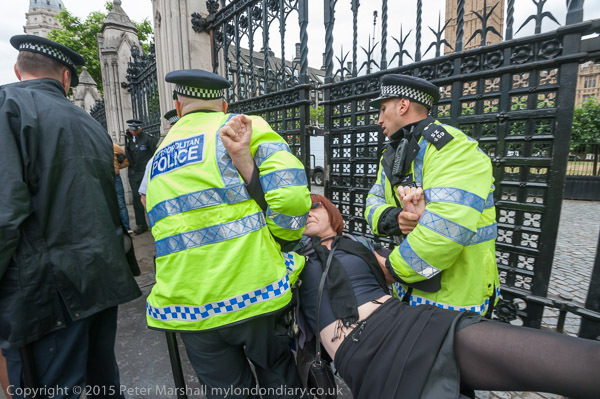 Of course her message didn’t reach the gates into Downing St, though a number of others did manage to get kicked or thrown into that high security zone. It isn’t really a picture that fits the 35mm format frame and would be better cropped a tiny bit at left and quite a lot at the right. Sometimes I do crop images before filing them, but often I’ll leave them un-cropped, knowing that too many editors have an apparently irresistible urge to desecrate images by cropping; if I crop to perfection they will then crop to destruction. The little surprise turned out to be a 23 metre (75 foot sounds much bigger and better) long banner which they ‘dropped’, hanging on tightly to it over the Albert Embankment wall facing the Houses of Parliament with the message ‘#Balls2TheBudget #DPAC’ before bringing it up to join the other DPAC protesters, some in wheelchairs who had be then marched from Downing St to block Westminster Bridge. It stretched all the way across the road and it was difficult to get a clear view of it for the buses it blocked and the protesters and other people taking pictures particularly those using their phones. Though I welcomed the cyclist who rode up to it at speed before jumping off his bike just before it to give me the picture above. The picture would perhaps have been better with a slower shutter speed to give a little blur as it was still rotating, but was able to nicely frame both it, the larger wheel of the London Eye and the banner. It was nice to have something a little different, and I had very little time to make the image before the cyclist lowered his bike. 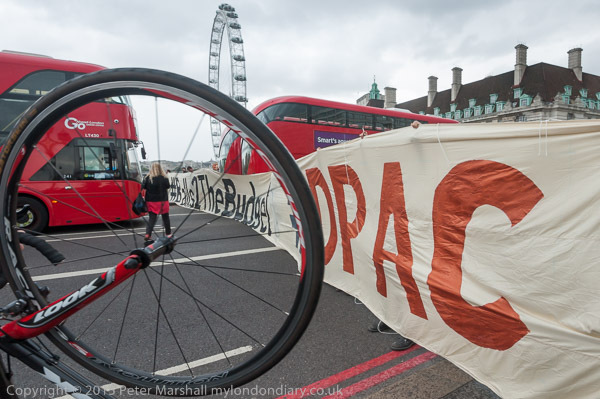 More pictures at DPAC blocks Westminster Bridge. 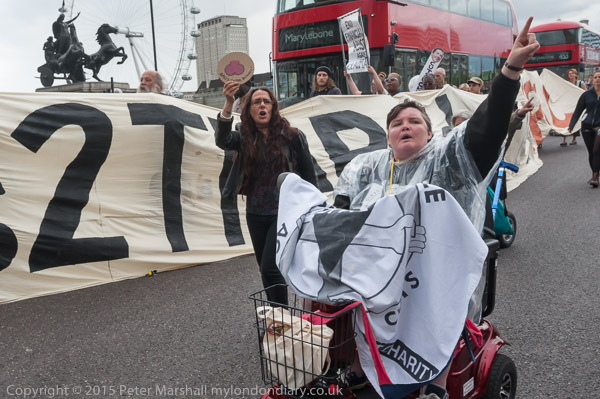 As protesters left Westminster Bridge they were led towards Parliament Square by DPAC’s Paula Peters on her mobility scooter, and as she came up to the statue of Boadicea – also in her chariot – I made a number of attempts to show the two of them together. I think this was the best, with Paula’s gesture echoing that of the statue in the top left. Boadicea probably burnt the town where I now live but was eventually defeated by the Romans. Paula’s chariot as yet lacks the scythes. 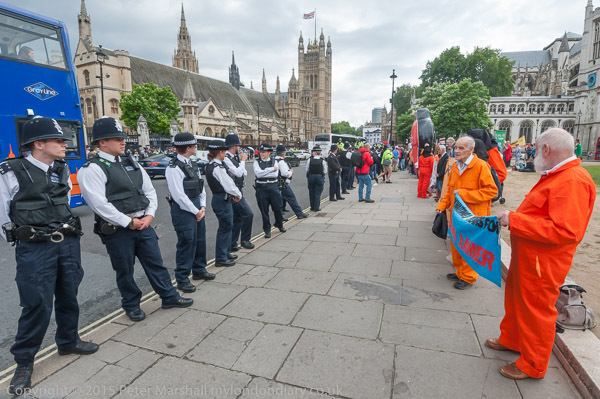 As the pictures in DPAC Parliament Square Budget Day protest show, the protest continued, for a while blocking traffic in Parliament Square. 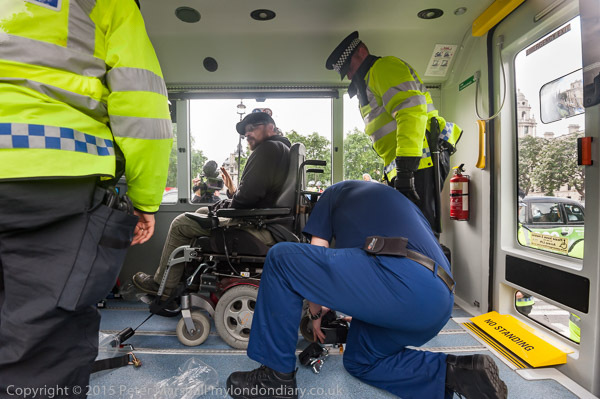 The police are faced with something of a dilemma by the protests by people in wheelchairs, realising the terribly bad publicity they would get by using the kind of tactics they use against other protesters. So while they may fairly forcibly drag away ambulant supporters, those in wheelchairs – at least while the press are around – are generally treated with rather more care. At this protest they had to hire a special vehicle which took quite a while to arrive to transport DPAC’s Andy Greene, locking down his motorised wheelchair with great care. Unlike police vans, it had large windows, and I was able (despite a little harassment by other officers) to photograph through them. They also took away pensioner Terry Hutt in the large and otherwise rather empty van. Two others arrested had left earlier in a more normal van. By the time I arrived at the police station in Savile Row an hour or so later, Andy had already been released, unusually fast as the police usually seem to prefer to hold people for long enough to release them in the early morning after most transport for them to get home has stopped as a little punishment even if they can’t find anything to charge them with. DPAC’s was not the only protest in Parliament Square, with people from several current industrial disputes in London – at the National Gallery and council workers from Barnet and Bromley – coming together for a Joint Strikers Budget Day Rally, and the usual Wednesday lunchtime Save Shaker Aamer weekly vigil who were confronted by an unusually large number of police lines up along the length of the pavement. Their persistence in calling for the release of Shaker and for him to be returned to be with his family in Battersea seems to have eventually been succesful, though as I write he is still held there. Obama has given the required notice of his release and he could have been on a plane last Sunday, but the authorities at Guanantamo apparently couldn’t handle both that and a visit by three US Congressmen. Quite what has been holding it up since then I don’t know, but I hope it won’t now be long before he is home. This wasn’t the end of my work on that Wednesday, but I’ve got jobs to do, so I’ll continue another day. This entry was posted on Wednesday, October 28th, 2015 at 10:47 am and is filed under My Own Work, Photo Issues, Political Issues. You can follow any responses to this entry through the RSS 2.0 feed. You can leave a response, or trackback from your own site.